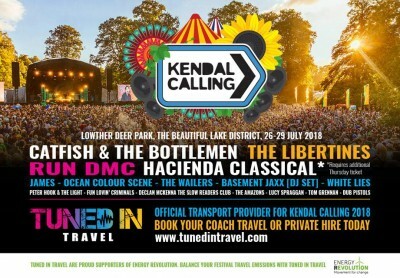 The ever growing masterpiece that is Kendal Calling is back for its twelfth year running. Music lover will gather on 26th-29th July for a year that promises to be bigger than ever. Set in what is usually the quiet Lowerth Deer Park, this multi-award winning festival brings the breath-taking Lake District alive, attracting people from all across the country to party together. Deemed ‘the best small festival in anywhere’ by Seasick Steve, this four day event is sure not short on excitement. The just announced line-up includes huge artists such the headlining British rock bands: The Libertines and Catfish and the Bottlemen. Also set perform are Run DMC, White Lies, James, The Lancashire Hotpots and much more! For those amongst us who want to explore music away from the main stage, there is yet more fantastic artist including Basement Jaxx and Gordon City in the Glow Tent and Twisted Wheel over at Houseparty. That’s not to mention the many other areas filled with talent ready to blow you away. There is truly a tune for everyone to dance to. While it may be the main attraction, top notch music is far from the only source of entertainment at Kendal Calling. It has everything weird and wonderful, from performance art including the must see Lost Eden, comedians in the Soapbox, cinema screenings, and plenty of family friendly activities in Kids Calling. The icing on this already mouth-watering cake? This festival boasts a huge array of food including Indian, Mexican, Tibetan and more. Dietary requirements are well looked after with options for veggies, vegans and gluten free! All this can be washed down at the Real Ale Festival, showcasing the Lake Districts best breweries. So, are you prepared for the time of your life at Kendal Calling? Tuned in Travel are ready to take you there, ensuring hassle free transport so you can focus on dancing the days away. We have an array of weekend return coach options from various locations throughout the UK, including large coaches being provided from all major UK cities; a perfect and easy option for those travelling solo or in small groups. Travelling in a larger group of twelve to fifty people and wanting something a little more exclusive? Then why not book one of our private high vehicles, chauffeuring you and your group straight to the action in pure comfort. If you can’t find a trip that suits your group or if you have any accessibility requirements, simply contact our customer service team at customerservice@tunedintravel.com for a free quotation. No matter your travel needs, Tuned in Travel offers a fast and easy booking process at competitive rates. Audience Travel accounts for 63% of Kendal Calling’s carbon footprint. Together with the forward thinking UK Charity, Energy Revolution, Tuned in Travel aims to balance fossil fuel travel miles, giving customers a chance to offset the pollutants generated during their travel with an investment into clean, renewable energy. 100% of donations made when you purchase your travel ticket will go to towards creating clean energy. Book and donate today to help keep the party alive in a brighter future.